September 20, 2017 By Sabrina Quairoli This post may contain affiliate links. Under the Cookies and Policies in the menu above, read the Disclosure Policies and Cookies page for more details. As I mentioned in an earlier post, September is National Preparedness Month. This month is a perfect time to remind you to review your office procedures and backup plans for emergencies. By doing this tasks, it tells employees what to do in case of an emergency like a hurricane or other natural disasters. It also shows your customers that you are thinking about their well-being. The clients who have concerns and issues and reach out to you for help or guidance will be your advocate when others are asking about your service. So, don’t let them down. With the extreme weather we have had over the years, it’s best to figure out a basic strategy on what to do for your small business. 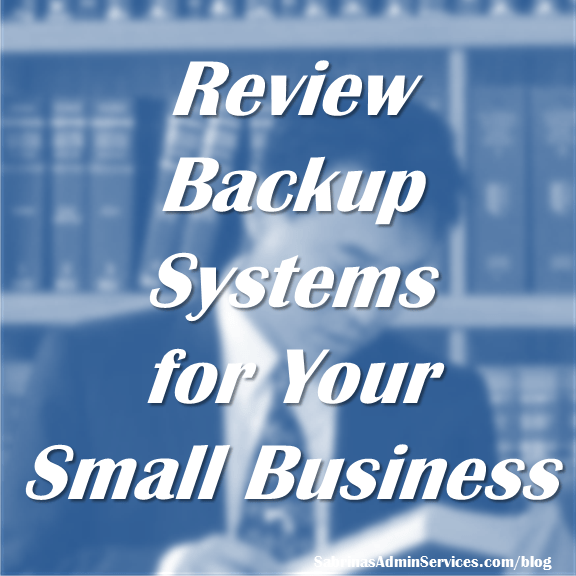 Below are areas to review to make sure your backup systems are planned out and are ready if you need them. Answer these questions and modify your plan accordingly. You can do this! Ask for help as needed. Create a spreadsheet that lists all these responses and print out on paper, save to your computer, and online for future use if needed. Make sure your plan is reviewed and revised at least every six months. Do you have a backup on your computer? Is it onsite or is it online? If yes, check to make sure it is still working properly. When was the last time you did a backup? Does it do it once a week automatically? Visit this article for more information if you do not have a backup system. The Beginner’s Guide to PC Backup. Where does your phone store its back up files? Do you have cables that you need for your devices? Where do you usually store them? How often do I backup my phone? Has it been doing a complete backup? Are there any errors? Add a column on the spreadsheet that will say “location of the item currently.” This task will help you when you are frantically running around to get your items together. Do you have a place that lists all your expenses (which includes the payee name, website, phone number, and amount you pay)? Does this list include when bills are due? Do you have your payables online through your bank or on paper? Do you have your client information accessible on more than one device? Do you back-up your client lists and leads off-site? Is all your customer information in your computer or is it still on paper? Make sure you add all your clients’ contact info in your invoicing software under the customer section for each account. Is your Social Media accounts secure? Do you have passwords that are strong? Do you have the passwords backed up somewhere other than my computer? Do you have a printed list of all your passwords? Does a least one other person have access to these accounts? Create a spreadsheet with all your passwords and username information. Visit this post: Tips to Make a Strong Password on how to create a secure password. Do you anything stored in the cloud? What files are stored in the cloud? Do you have more than one place to store your general digital data? Are all your papers scanned into the computer if you need to reference them? Set time aside to scan important documents and keep them on your computer just in case you have to go in a pinch. Do you have a “what to take with me” plan? What items do you physically need to take with you? Can you scan these items, so you don’t have to carry them physically? Are these items able to be stored in an accordion folder for easy transport? Write down what tasks to complete if you have to leave immediately. Keep all these steps in one password protected spreadsheet file or in Microsoft OneNote or Evernote so to access it across different platforms. This task will give you peace of mind if you forget something when you are in a rush. Here are other posts that talk about what to set up before an emergency for your small business. Important Tasks that will get you on your way to setup a backup plan. I hope this helps you and your small business get ready for any emergencies that may come your way. I hope you will never have to refer back to any backup procedure you created, but if you do, you will be ready.